Update: Thanks to everyone who attended the April 9, 2013 preliminary design concept meeting. The project team greatly appreciates the feedback received and will seek to incorporate these ideas and comments into the final plan for South Yale Boulevard. If you were not able to attend the meeting, you may use the links below to download the documents that were presented. The project team welcomes any additional or new comments you may have about these preliminary design concepts -- several methods for providing feedback are provided below. The documents linked below were presented to stakeholders at a meeting held at the Loma Linda Community Center on April 9, 2013. They include overviews of existing conditions and opportunities along the corridor, envisioned future development on the corridor and preliminary proposals for improvements to the streetscape. Street Segments and Characteristics: This document describes envisioned futuredevelopment, by segment, that would be served by streetscape improvements. Study Area: This map shows the project study area, transit stops, key intersections and points of interest. Note: the following 3 documents are 24 X 36 inch posters. Use the zoom tool in Adobe Reader or Acrobat to read text or view individual items up close. Concept Plan - Segment 1: This map shows proposed improvements to the streetscape between Avenida Cesar Chavez and Kathryn Ave., including sidewalk widening, addition of on-street parking and proposed reconfiguration of the intersection of Yale Blvd. and Kathryn Ave.
Concept Plan - Segment 2: This map shows proposed improvements to the streetscape between Kathryn Ave. and Ross Ave., including a pedestrian crossing at Loma Linda Community Center. Concept Plan - Segment 3: This map shows proposed improvements to the streetscape between Ross Ave. and Gibson Blvd., including new medians and gateway signs. You may provide feedback on the presentation materials or the plan in general by clicking here for an online comment form. You may also contact the project manager for City Council Services, Kara Shair-Rosenfield at 768-3114 or [email protected]. The City has retained the nationally-recognized transportation planning firm Kimley-Horn & Associates to help develop a "Complete Street" Master Plan for South Yale Boulevard between St. Cyr Ave. and Gibson Boulevard. A "Complete Street" is a street that is designed to facilitate the efficient, safe, and comfortable movement of all different user groups: motorists (drivers), pedestrians, transit user, and bicyclists. Information about upcoming meetings and documents related to this planning effort will be posted on this website, so please check back often for updates. Policy Directive: The South Yale corridor is discussed in two recently-adopted City plans: the South Yale Sector Development Plan (SYSDP, 2009) and the Clayton Heights Metropolitan Redevelopment Plan (MR Plan, 2010). Both plans identify redevelopment opportunities along the South Yale corridor but discuss the need for the corridor itself to be improved in order to attract private investment and complement future land development. The corridor sees high speeds and relatively low volumes of traffic, and both the Sector Plan and MR Plan call for this section to be reduced to a 3-lane configuration. The Sector Plan and MR Plan both also contain recommendations about how to redesign and improve the corridor. 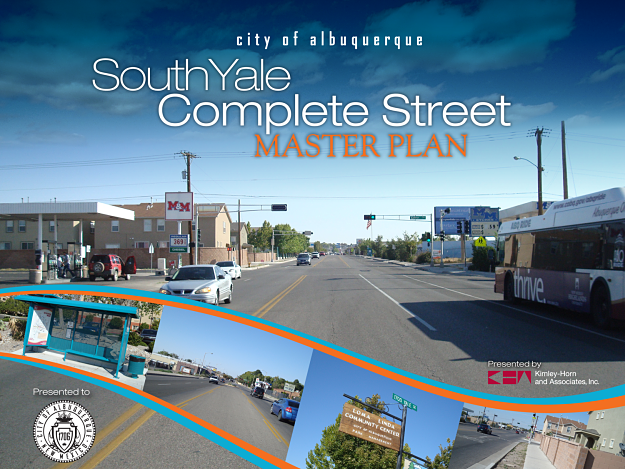 The goal of this planning effort is to further develop the conceptual ideas contained in the SYSDP and MR Plan in order to create an implementable “Complete Street Master Plan” for the corridor. Plan Area and Character: The plan area is from Gibson Blvd. on the south to Avenida Cesar Chavez on the north, covering a distance of just over 4,000 linear feet (approx. ¾ mile). Land uses along the corridor are quite varied and include, but are not limited to residential, retail, traveler services (hotels and motels) and a park and community center. Many parcels along this corridor are vacant. Roadway Classification: The corridor, a designated minor arterial that connects the Albuquerque International Airport (Sunport) and the University of New Mexico (UNM), is important to the city, as a whole, and to the adjacent neighborhoods, in particular. South Yale has the potential to function as a gateway to the city, serving both visitors and residents, but is currently far from meeting that potential due to its antiquated roadway design and inadequate pedestrian and other amenities. Bus and Bike Facilities: There is a bus route (#50) that runs the length of Yale Boulevard from Gibson Blvd. to Central Avenue. Yale does not contain any on-street bicycle facilities and is not identified as being a part of the future bicycle network. Buena Vista Drive, which runs parallel to Yale one street to the west, is the area’s designated north-south bicycle route. To further develop the conceptual ideas contained in the SYSDP and MR Plan in order to create an implementable “Complete Street Master Plan” for the corridor. To improve the quality of life of area residents and create a sense of place through the design and construction of a safe and attractive roadway.